Double solitaire is a single-person game played in the company of anothertwo people seated at the same table, each negotiating with his own set of cards, luck of the draw, and strategy. Their 52-card sets, though, are dealt by shuffling together two separate decks, and the game is competitivethus, our players’ fates are intermingled from the start. 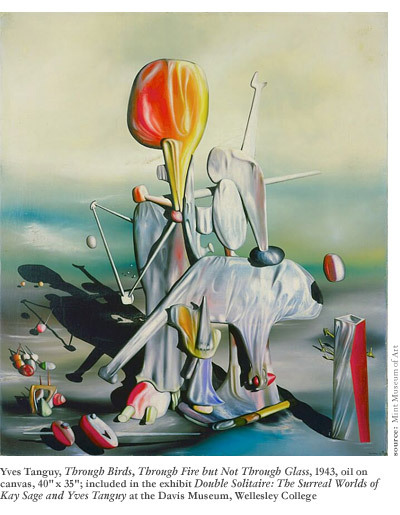 Such were the lives and creative work of Yves Tanguy and Kay Sage, married and painting “together” for 15 years in their rural Connecticut home. 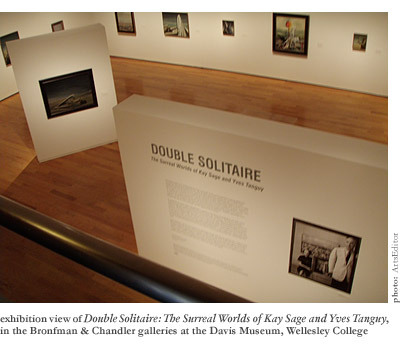 Their love story is for the movies, told in the traveling exhibition Double Solitaire: The Surreal Worlds of Kay Sage and Yves Tanguy, on view at Wellesley College’s Davis Museum through January 15th, 2012. Prompted by the donation of Sage’s 1947 On the First of March Crows Begin to Searchthe Davis’ first Surrealist acquisitionthe opening reception in October also marked the museum’s reopening for the new academic year. Tanguy and Sage were always resistant to being seen as a team or being billed together, but this exhibitcurated by Surrealism scholars Jonathan Stuhlman and Stephen Robeson Milleraims to draw essential connections between the two artists’ work. Only once before have the artists had a joint exhibition, at the Wadsworth Atheneum Museum of Art in 1954Tanguy’s work occupied the main space, and Sage’s paintings were hung in smaller, secondary galleries. But today, Sagein many ways overshadowed by Tanguy’s established membership in the Surrealist movement, seniority as a painter, and the inevitabilities of his gender in 1940sis finally given due credit in the exhibition’s argument for mutual influence, contrary to most art historical writing on the two to date. In a mixture of art history and biography, the current exhibition provides a snapshot of the Surrealist clan in the years before, during, and after World War II through the lens of an inseparable Yves and Kay in the days of their courtship, throughout the years shared in adjoining Connecticut studios, and continuing on into Sage’s work beyond Tanguy’s untimely death in January 1955 until her ultimate suicide eight years later. Beginning with an example of Sage’s naive abstract geometric work from 1937, Double Solitaire alternates each artist’s paintings along the gallery walls, highlighting surprising formal echoes from Sage’s paintings to some of Tanguy’s work that immediately followed. Tanguy’s paintings are unmistakablesparse but not somber; hazy, often horizon-less landscapes, littered with amoeboid objects. Sage’s imagery is more grounded and monochromatic, repeatedly invoking draped cloth, wicker, andincreasingly in her later workcolumns of wood and steel scaffolding. A clear horizon is usually present, as is a sensorial invocation of the sealearning that much of her childhood was spent on the coasts of Italy comes as no surprise. Born into a wealthy American family in Albany, New York, Sage traveled through Europe with her divorcee mother, attending parties overflowing with elite and worldly society. Tanguy was charmed by her sophistication, intelligence, and wit; Sage loved Tanguy for his free-spirited joie de vivre. In her youth, Sage developed an interest in art, and after attending the Corcoran College of Art in Washington, DC, she began working in an abstract geometric style. She married her first husbandthe Italian nobleman Prince Ranieri di San Faustinowhen she was 26 years old. She would later describe the decade they spent together as a “stagnant swamp,” during which she barely completed any artworks, seemingly oppressed by the stifling atmosphere. She began painting again in earnest after their divorce in 1935. Meanwhile, Tanguytwo years Sage’s seniorwas born in Paris, but grew up with his mother on the western tip of France. Returning from the army in 1922, he stumbled upon a Giorgio de Chirico painting and became determined to form his own life as a Surrealist painter, despite his lack of formal training. Two years later he was introduced by army friend Jacques Prévert to André Breton, poet and leader of the then-burgeoning French Surrealist movement. In 1936, Sage saw a Tanguy painting for the first time and felt instantly captivated. The work’s title, I Am Waiting for You, would seem powerfully prophetic to her in retrospect. The two did not meet in person until 1938, at an exhibit of Sage’s art in a Paris salon. “Kay Sageman or woman? I didn’t know,” Tanguy recalled. “I just knew the paintings were very good.” By this time, Tanguy had also been married once, and the two artists became an inseparable item, ultimately marrying in Reno, Nevada in 1940. 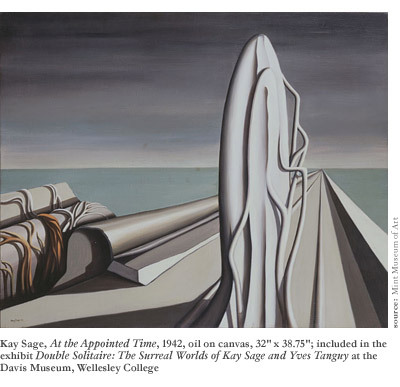 Kay Sage’s paintings constituted the more representation oeuvre, often including a large, columnar object in the foreground competing with the vertical stance of the viewer. In Monolith (1937), Margin of Silence (1942), and At the Appointed Time (1942), all shown in this exhibition, anthropomorphic objects loom close to the viewer, dominating the pictured space. 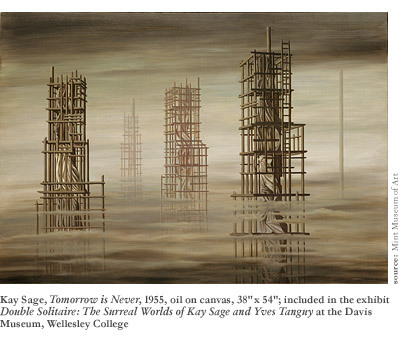 With Bounded on the West by the Land Under Water (1946), Sage transitions into her later theme of scaffolding with tilted, skeletal buildings overlooking a gray sea. The scale and quality represented in a typical Yves Tanguy painting are reminiscent of Hieronymus Bosch. A downward-looking perspective presented from a great height and distance creates detachment, and draw observation over a larger area or scene than do Sage’s works. A chief assertion of Double Solitaire is that, while Sage was drawn strongly into the orbit of Surrealism through her association with Tanguy, she likely prompted his slow drift away from this sense of distance and toward a more close-up, obtrusive perspective, often featuring dominant foreground objects. Through Birds, Through Fire but Not Through Glass (1943) is one of Tanguy’s first paintings to do so, with a large, stacked structure resembling frosted glass with colored appendages featured at dead center. Many of his later works continue in this vein, and his famous Fear (1949) achieves its dynamic quality by framing its central objectanother glass-like polygonal blockbetween two mountainous columns immediately before the viewer. Similarly, it seems as though Sage drew Tanguy towards an increasingly-subdued palette, reducing the punctuating spots of bright, primary colors that he seemed fond of before their relationship began to develop. The heart of Double Solitaire, however, lies not in an analytical comparison of these two bodies of work, but in the photographs, anecdotes, and quotations that fill the space of a quiet museum with the bustling spirit of social drinking, parlor games, and lifelong friendships that Tanguy and Sage maintained with other Surrealist couples, including the Calders, Mattas, Gorkys, Buñuels, and others who would pass through their country home. A wall of candid, black-and-white photographs capture the friends together, and finds a delightful scene-setting context in a display case at the center of the gallery filled with pictures from the interior of their home, presenting their living room from three different angles and revealing a pool table, an Alexander Calder sculpture, and a painting gift from André Breton. Pleasant as those times may seem in pictures, the cloud of World War II then hung over the Surrealists, many of them new immigrants helped by Sagean Americanto flee from Europe to the United States. In this way, rural Connecticut became a place where these artists waited out the war in each other’s company, an uncertain time for those preoccupied with the depths of the subconscious. In the style of double solitaire, Tanguy and Sage competed both deliberately and unconsciously in their artwork, a tension that is dramatically highlighted by a number of pairings in the exhibition, including Tanguy’s Suffering Softens Stones (1948), a somewhat mirror image of Sage’s The Wind in a Corner (1949), or Sage’s Small Portrait (1950) viewed against Tanguy’s formal echoes of that bust in The Hunted Sky (1951). The thesis of mutual evolution is noted in the chronological arrangement and careful selection of paintings that make clear the curators’ point. Of all the back-and-forth, however, no response is as strong as Sage’s practically tributary pieces made after Tanguy’s death. Both painters were deeply superstitious, and when a bird appeared in their home in 1955 they worried that the harbinger of death would prove true. Tanguy suffered a cerebral hemorrhage in the middle of the night, and died hours later, at 55. Sage became depressed and withdrawn. A Bird in the Room (1955)a reference to the ominous fowlis one of her most desolate paintings. Dark and murky, abandoned satchels, straps, string, and other debris hang on wooden beams fronting a cloudless night sky. Tomorrow is Never (1955) depicts a landscape of fog-shrouded scaffolding over a horizon unseen; such works reflect her heavy gloom. With advancing age, Sage’s eyesight deteriorated to the point that she took up collage to replace painting. After a botched cataract surgery, she was left nearly blind, and on January 8, 1963three days after her late husband’s birthdayshe shot herself in the chest. Her suicide note read, “The first painting of Yves that I saw before I knew him was I’m Waiting for You. I’ve comenow he’s waiting for me again. I’m on my way.” Their ashes were strewn at sea by their dear friend Pierre Matisse. As a whole, Double Solitaire features an excellent collection of Surrealist paintings, providing a crucial window into the culture and politics surrounding art communities during the era of World War II. Even more powerfully, a small story of a dramatic age is sold in the picaresque representation of Tanguy and Sage’s tremendous romance and profound connectiontwo pioneering artists and intellectuals in their time, close companions with great respect for each other, and partners very much in love. Taking in the breadth of their relationship on and off the canvas at once, a visitor can readily understand both their then-preference to be showed separately, and the importance ofin retrospecttaking their works together now, a sublime demonstration of love and humanity realized in art.